This Owner Is Anxious to Move to Ambergris Caye! After a person invests in a pre-construction condominium on our Isla Bonita paradise, they are often anxious for their unit to be finished so that they can move in. Â Take Baymen Garden owner, Jim Knuff, for instance... At the time Jim bought his unit in Baymen Garden's Building A, he was getting ready to sell his Las Vegas home. Â It didn't sell overnight. Â But once it did, he was chomping at the bit to live the Caribbean island lifestyle on Ambergris Caye. 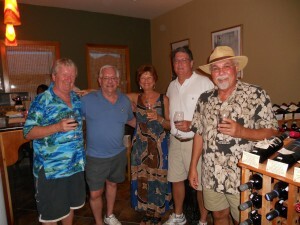 Jim was one of the first investors in Baymen Garden, Grand BaymenÂs garden condominium community. 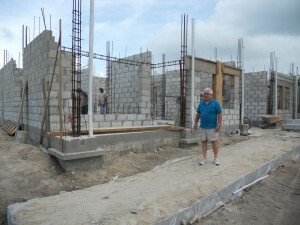 Â Construction of Building A is now well underway.Â So this week Jim visited us on Ambergris Caye, to check in on his future home.Â Bottom line - he decided itÂs time to move to Ambergris Caye. Since JimÂs unit isnÂt ready yet, heÂs decided that itÂs worth it to rent for a while.Â One purpose for his trip was to start looking for a short-term rental.Â HeÂll live there until his unit is finished, around June 2012.Â And, he wanted to start working on his QRP residency application, setting up ban accounts, and other tasks that are part of a major move. It was a pleasure to get to know Jim better.Â We had only spent time with him at a conference and the Chill Weekend he attended.Â HeÂs one of those laid back kind of guys that are full of surprises. Â Easy going and non-assuming, he's not not at all a macho kind of guy. Â So I was quite surprised to learn that he'd been a deep sea construction diver.Â He worked in the North Sea, Africa and Asia, mainly doing oil rig related diving. Â This type of diving pays well, but is a high risk, dangerous way to make a living. Â So, after a Â number of years, he shifted to working on the ocean-based oil drill rigs themselves. Again, he worked in world-wide locations. After marrying, Jim and his wife Trish lived in the Philippines, and later in St. Croix.Â So heÂs no stranger to the overseas lifestyle.Â He and Trish owned an import/export business for ten years.Â Much of that time they lived in the Philippines.Â Eventually they sold that business and moved to St. Croix.Â ThatÂs when Jim became a casino card dealer.Â He and Trish eventually moved to Las Vegas.Â He continued to work in casinos, but this time moved into surveillance.Â He worked at the casinos until he retired a few years ago. Clearly, Jim may be modest and unassuming, but he is a guy who's always been open to taking risks and trying new lifestyles.Â Unfortunately, his wife passed away several years ago.Â So he's starting this new adventure on his own. 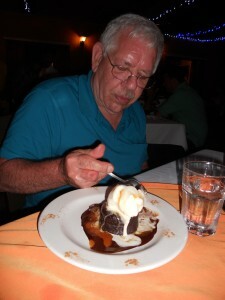 I can understand JimÂs impatience to start his new life.Â I had waited about seven years before I could afford to leave my career behind and move fulltime to Ambergris Caye.Â My challenges were totally different than JimÂs.Â But the sentiment was the same.Â There are times when we know that we are ready for a major life change. The next day I took Jim, and his buddy Larry, on a golf cart tour around the island.Â It was easiest to point out, from the vantage of a golf cart, where he could go to accomplish each task.Â (Larry was just along for the ride.Â Of course, he'd be reporting back to his wife later.) Â That day Jim headed directly to Caye International Bank, to get an update on their international bank account options.Â Then he dropped in at Georgetown Trust.Â Trevor helped him to start his Qualified Retirement Person application process. 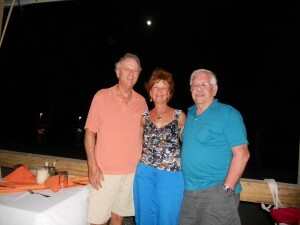 We asked the resort staff to help set up a physical exam for Jim, with Dr. Lerida Rodriguez. They quickly set up his appointment for the next morning.Â Once he had the exam results, heÂd take it back to Trevor, to submit his QRP application. Trevor explained that Jim should have his QRP status approved by the time he returns in October, to find a rental unit. Â Then Jim will need to go to Immigration to get his QRP card. In the afternoon I met with Jim to go through his list of questions.Â Now that heÂs serious about moving, he had several pages of detailed questions to address.Â After we slogged through the list, I took the guys over to the REICA office, across the street, to meet CV May.Â We set up an appointment for CV to take Jim out the next day, to look at potential rentals.Â REICA is the realty that represents Grand Baymen condominium properties.Â But they also show and sell other real estate on the island, and on the mainland. On Friday morning Jim completed his physical and took the results over to Georgetown Trust.Â Then CV drove him around the island to take a peek at several potential rentals. We look forward to the day that Jim will be our neighbor at Baymen Garden, once his unit is finished.